Judging by today’s release of manufacturing conditions by the Institute of Supply Management (ISM), August provides a good omen for new industrial orders. And, as go orders–so goes the industrial sector. On the heels of the report for July a month ago it was reasonable to expect some ebbing in the overall ISM index for August, as production—on the margin–appeared to move well ahead of (very firm) July order rates. Typically when production sprints ahead of new orders, some backtracking occurs in the subsequent month as production is brought down to meet new orders and avoid unintended inventory accumulation. 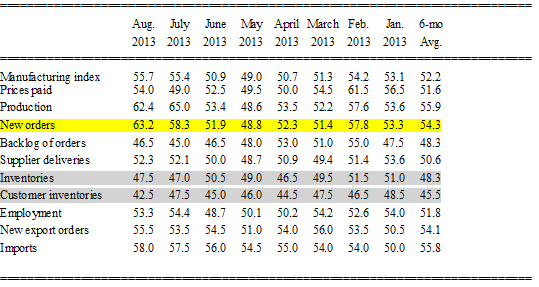 While production did ebb a bit in August, new orders leapt to help close the gap (yellow highlight in table below). Meanwhile, inventories (grey lines in table) continue to appear lean across the supply chain which bodes well for underlying growth dynamics. ”“The past relationship between the PMI™ and the overall economy indicates that the average PMI™ for January through August (52.5 percent) corresponds to a 3.2 percent increase in real gross domestic product (GDP) on an annualized basis. In addition, if the PMI™ for August (55.7 percent) is annualized, it corresponds to a 4.2 percent increase in real GDP annually. Sustained 3%+ growth has not been registered across the economy in years. While the gloom and doom camp will see today’s report as a reason to fear the “tapering” of the Federal Reserve’s pedal-to-the-metal monetary policy, higher interest rates that may result because of increased confidence in the economic expansion sure seems like is a favorable thing. In any event, even if the overall economy continues to follow its grind forward pace, the industrial sector is apt to continue to grow faster than the economy at large and represents fertile investment ground as the technology and energy revolutions continues to unfold. Sept. 3 (Bloomberg) — Following is a summary of U.S. manufacturing conditions from the Institute for Supply Management. The Bloomberg median estimate from 85 economists was 54. The revised breakeven point for the overall economy is a PMI of 42.2 percent. A PMI over 42.2 percent indicates an expanding overall economy. A PMI below 42.2 percent indicates the overall economy is declining.